It has been two years since the war launched on the Gaza Strip. On 27th of December 2008 at 11:30, explosions were heard everywhere; and then the nightmare of 22 days begun. The nightmare, which resulted in 1,434 martyrs and 5,303 injured most of them were children. For most of the Gazans, the war did not end yet. Its memories bring alive the moment of the war. Everyone in Gaza has his own story to tell about the war. The war came into our houses like a thief, stole our beautiful and precious things and left for us pain and agony. Every house, every family, every person, every child and even me has a story of loss, fear and horror. I have lived the moment of fear and horror that I might wake up; and I do not find my family around me. In my dreams, I have seen my mother crying beside my dead body. The suffering did not end. Mothers still remember their children dying in front of their eyes, fathers still smell the blood of children on their hands and some children are still afraid that the war might come back again. There are many tragic and appalling stories to tell. Al Samouny family’s story, Jamila Al Habash and Om Ahmed Fawaz Saleh all suffered from the brutality of the war. Al Samouny family’s plight began with the Israeli incursion into and firing at Al Zaytoun neighborhood. The Israeli occupying forces started bombing the area leaving no way out to the people living there. As the situation deteriorated and the shelling intensified, Al Samouny family sought refuge in Tallal Al Samouny’s house, thinking that they would be safe there, 60 members of Al Samouny family gathered at Tallal’s house. They were left without water for 24 hours. Unconcerned about the people’s lives in the area, the Israeli forces continued shelling the house. Emergency services were banned from reaching the area. Dead bodies of Palestinians lay in the house, only thirteen family members were still alive. Eight of them were children, some of them injured, who had been locked in for three days with the bodies of their dead parents and family members, with no access to food or water. Overall, 26 members of the Al Samouny family were killed, including 10 children and 7 women. Back to the children who had been locked in with the dead bodies for three days. Those children will be traumatized by the sad and mournful memory of seeing their parents dying in front of their eyes. They will be imprisoned in their painful past forever. Can any child in the world endure what those children have undergone? Om Ahmed Fawaz Saleh has a story of loss to tell. Om Ahmed lives in Jabalia; she had four children. She lost two of them in the war, Ahmed and Fawzia. During the war, Jabalia was subjected to an intensified Israeli shelling. Most of people there left their houses to seek shelter. Om Ahmed did the same thing. She wanted to take her children to a safe place, her sister’s house. She started packing her children’s clothes, but the Israeli forces were faster than she was. As her children stepped out of the room, a missile hit the house. Ahmed and Fawzia achieved martyrdom, and the other two children were injured. Om Ahmed tried her best to save her children, but she could not. She spoke about her children with tears in her throat. She remembers her sons, Ahmed’s, dreams. She said:” Ahmed wanted to go to the kindergarten; he wanted to buy me sweets with his pocket money. But his dream will never come true.” Om Ahmed has nothing left for her except memories that will always bring the harsh moment of war. Jamila Al Habah is another evidence of the Israeli barbarity and cruelty. Jamila is a 15-year old girl who lost her legs in the war, when her house was bombed by a missile. Her sister and cousin were killed. Jamila was taken to the hospital and had several operations. When she woke up, she discovered that her legs were amputated. In spite of her ordeal, Jamila decided to be a strong girl, smile, and continue her way towards her dreams. 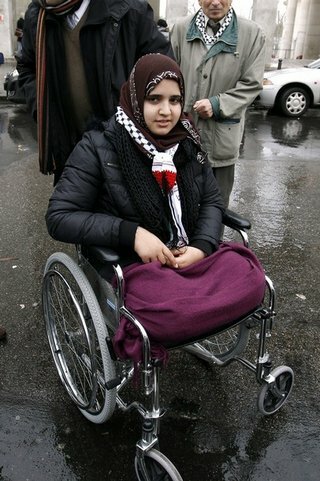 Jamila went under physical treatment and used a wheelchair. Now she is able to walk using crutches with artificial limbs. When I met Jamila, I was impressed by her beautiful smile and her strong will. She challenged her plight. She continues going to school every day on crutches. Looking at her gave me hope. She is willing to achieve her dream and be a famous journalist. Her story is a story of faith and hope. The Israeli war caused the Gazans so much misery; but it did not break our strong will to exist. The Israelis are to be held accountable for their crimes against humanity, and the truth will be exposed one day. Despite the war, the life in Gaza did not die. Nothing will kill the Gazans’ spirits. Finally, I would thank a friend of mine who supported and helped me in writing this article; a friend who has a story of loss; but it was so painful to talk about it.